Our latest podcast episode, “Introducing the Behavioral Product Manager,” features guest Kristen Berman, co-founder of Duke University’s Common Cents Lab, as well as co-founder (with Dan Ariely) of Irrational Labs. Kristen was on the founding team for the behavioral economics group at Google and has spoken at Facebook, Fidelity, Equifax, Stanford, and many more leading companies. Kristen hosts one of the top behavioral change conferences globally – StartupOnomics – and she also co-authored a series of workbooks (again with Ariely) called Hacking Human Nature for Good: A Practical Guide to Changing Behavior. So…yeah. Like Ron Burgandy, Kristen is “kind of a big deal.” One of the many reasons she is such a sought-after expert in this field is because she has a unique understanding of both sides of behavioral science: the research side and the applied side. It is one thing to identify a cognitive bias in an academic or laboratory setting; it is quite another to translate it into layman’s business terms and convincingly identify how this knowledge can be applied to organizations across industries to help them improve their processes and turn a profit. In this edition of Action Design Radio, Erik and Zarak chat with Kristen about her philosophy of incorporating behavioral science into the Product Manager’s domain, thus creating what she dubs the Behavioral Product Manager (BPM). In this podcast – and in an article written earlier this year for Medium – Kristen outlines how behavioral science gives us the missing pieces of the Product Manager’s toolkit. For example, a BPM would prioritize measurement and experimental infrastructure sooner than a normal PM would, highlighting that you can’t move a company toward consumer outcome if you’re not properly measuring it. 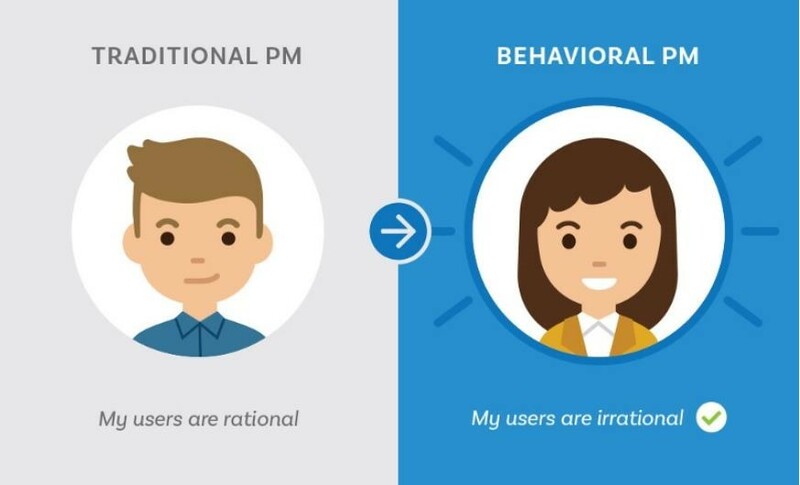 Most companies, as well as their Product Managers, use traditional methods like focus groups and interviews to find out what their customers “think” and how they “feel.” But the Behavioral Product Manager concentrates on things like behavioral mapping and identifying friction, because the behavioral world focuses more on what people do and less on what they say. That last concept was important, so I’ll repeat it: behavioral science professionals focus more on what people do and less on what they say they do. It’s old news that we as consumers oftentimes do a very poor job of accurately identifying what we feel, and an even worse job of articulating why. Because of this, Kristen believes companies need to spend more time on implementing a 3B Framework. If users are logging in, great. But once they're logged in, do we even know they're properly using the service? Identifying and then measuring the proper behavior is crucial. Companies’ classic downfall in this step is to be too vague. Kristen insists that you need to “get uncomfortably specific” when identifying the behavior you are trying to target and then modify. “Increase employee savings” is general, “Increase employee 401k contributions by 3%” is specific. Eliminate all barriers if possible, but if not, reduce as many as you can. The essence of this step is reducing complexity. Use things like defaults to simplify user choice and avoid choice overload or paralysis. The goal here is designing for the path of least resistance. In other words, Make. It. Easy. Or as Michael Scott would say, the KISS method: Keep It Simple, Stupid! Direct and immediate benefits are key, since countless experiments have shown that people are significantly more motivated by the prospect of an immediate reward than by a future one. You don’t need to be fluent in hyperbolic time discounting theory to realize that humans have a penchant for immediate gratification. Maybe your company needs to increase the benefits of a product or service, or perhaps they’re just not communicating the current benefits well enough to consumers or employees. You want to design for a benefit that triggers an emotional connection. Function can be useful too, but emotion is stronger and thus more likely to result in people actually engaging in the desired behavior. Meticulous behavioral mapping is also a huge part of what goes into making a good BPM. That involves outlining every step that goes into a process, identifying any possible friction, and then making sure the proper data-tracking metrics are being utilized. Mapping out what people do is a critical behavioral skill. PM’s are usually evaluated on customer and business outcomes. BPMs figure out strategic ways to run experiments and gain customer insights in ways that are not intuitive. Behavioral science requires people to justify their intuitions with data. Empirical, observational data is where it is at for the BPM. And if you are reading this and this stuff really interests you, but you just don’t know where to start: Start Small. Read up on Loss Aversion and start using the term with your work team. Once you’ve got everyone thinking in gain/loss frames, move on to some more advanced concepts of Choice Architecture, like re-assessing whether your company is using the right incentives. Or share around the office this TED video of Barry Schwartz talking about The Paradox of Choice, and then have a conversation about whether your company is simply giving its customers too many options to choose from. You have options. Now it’s just a matter of pinpointing the best one. Your work as a BPM has already begun.